The Semantic Web is all about understanding the meaning behind entities and keywords. 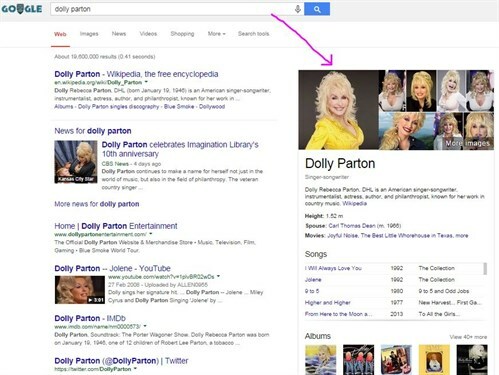 For years, Google has been indexing things like “Dolly Parton” and returning pages and blogs about her. The big challenge has been connecting and understanding all the unstructured scraps of data that litter the web. Let’s face it, Google could not care less about individual websites. All it cares about is data. I guess this is a good thing, because it means users will be given the answer more quickly and without interruption. However, it’s making the SERPs an increasingly difficult landscape to compete on. With Authorship, Review and Video snippets slowly shrinking, Google is turning our attention to their own answer cards. A great piece of advice is to look at the mobile SERPs for a window into the future of desktop. We can’t beat Google, so joining is imperative. If we want a chance of being quoted on answer cards, or taking advantage of advanced search boxes in the SERPs, we should structure our data for Google. Schema and JSON-LD are increasingly being used to structure website data for Google, and help different systems interoperate across the web. This can allow multiple websites to reference, share and express data, making it more useful to the online community. We can even mark up our emails, making them actionable within email service providers like Gmail. We are only scratching the surface of contextual and related data. Google is going to be relying on structured data to deliver increasingly high quality results. Our mission, as SEO marketers, is to make our sites crawlable and to make them valuable to searchers. This is our opportunity to improve the connectivity of the web, whilst improving the visibility of our clients’ websites. It’s quite exciting.